I use heart rate training when I run as opposed to pace or speed. I find it works well for me and means that I run more in tune with my body and how I’m feeling, instead of just trying to run as fast as I can. 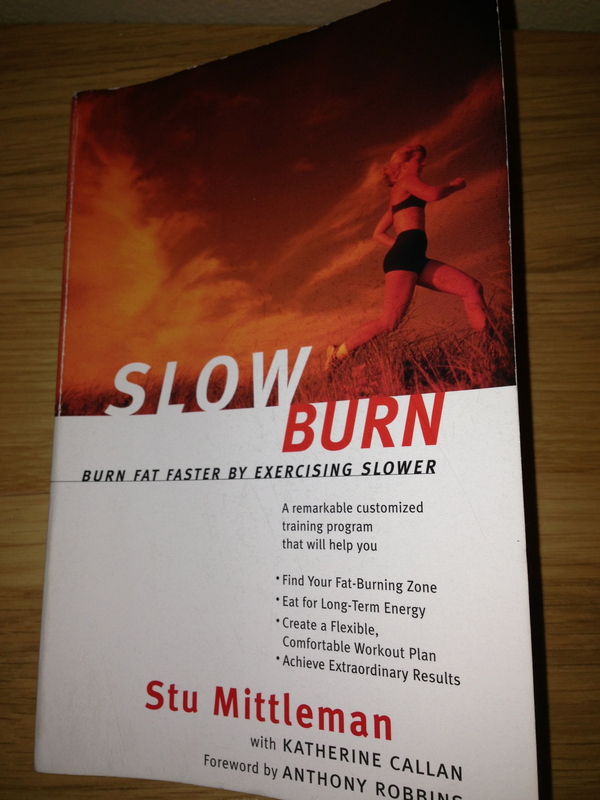 I got the idea from Stu Mittleman’s book ‘Slow Burn’ and it has honestly been a life changer for me in the way I run and the way I train. For more information, read this post I wrote about heart rate training, and see my review of Slow Burn here. I clearly recognise the indicators here from when I go into each zone when I run. 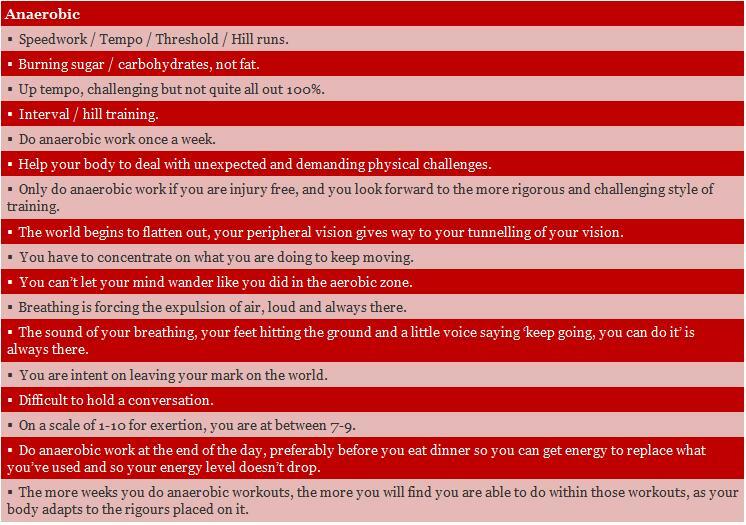 And it’s made me really think more about what my heart rate is at when I’m running, so that I don’t under or over do it. (Or I choose, with the help of my heart rate monitor and the zones, when I’ll over or under do it, to be more precise). Here’s my blog post about different Run Workouts within the different Heart Rate zones…. … How do you work out your Aerobic, Effective and Anaerobic heart rate zones? 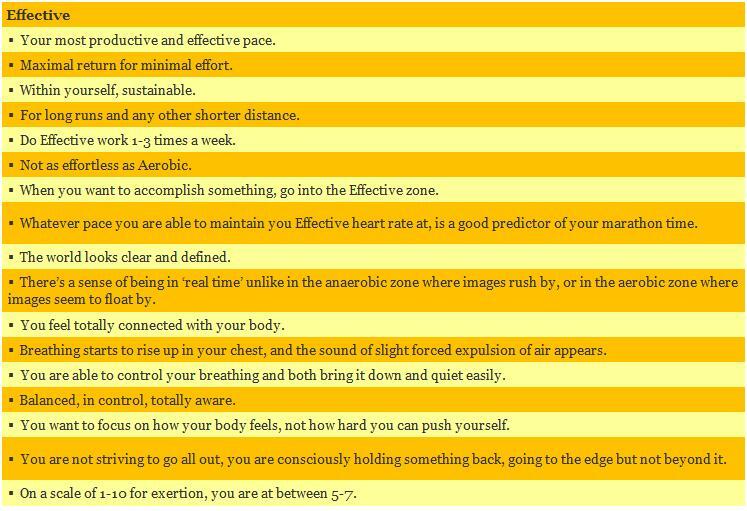 Level of aerobic activity you partake in. For me, my initial lower Effective HR: 139. +10 beats to the lower and upper limits if you do more than 3 hours of aerobic activity a week. +5 beats to the lower and upper limits if you do less than 3 hours of aerobic activity a week, but you are aerobically active. -5 beats to the lower and upper limits if you are just starting out. -10 beats to the lower and upper limits if you are on medication or recovering from a recent illness. Your lower Effective HR – 20. For me, my lower Aerobic HR: 149 – 20 = 129. Your upper Effective HR + 20. For me, my upper Anaerobic HR: 159 + 20 = 179. And based on my Heart Rates in the zones above, I’d say that my most effective heart rate is: 155, between 150 – 160. See here for my Heart Rate Zones Calculator and here for Heart Rate Zone Workouts. What about Garmin Training Effect? 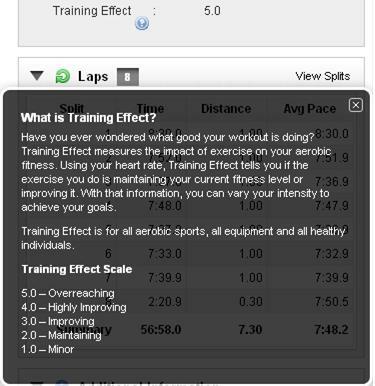 You might find me talking about the Garmin Training Effect in my blog … it’s a new feature of the Garmin 610 where your Garmin will give your workout a score from 1-5 and helps you to decide on how you might vary your training accordngly. It’s become another good indicator for me to let me know how hard I worked and how I can adapt my training.